Washington - Islamic militant groups ignored contact attempts from Pakistan-born Tashfeen Malik in the months before she and her husband killed 14 people at a California holiday party probably because they feared getting caught in a U.S. law enforcement sting, U.S. government sources said on Thursday. The number of organizations Malik, 29, tried to contact and how she tried to contact them were unclear, but the groups almost certainly included al Qaeda’s Syria-based official affiliate, the Nusrah Front, the sources said. One source said the government currently has little, if any, evidence that Malik or her husband, Syed Rizwan Farook, 28, had any direct contact with Islamic State, which has captured control of large parts of Syria and Iraq. Islamic State said last week the couple were among its followers. The militant groups likely ignored Malik’s approaches because they have become extremely wary of responding to outsiders they do not know or who have not been introduced to them, the sources said. The Dec. 2 shooting massacre by Farook, the U.S.-born son of Pakistani immigrants, and Malik, 29, a Pakistani native he married in Saudi Arabia last year, has heightened security concerns in the United States and has become an issue in the U.S. presidential campaign. The FBI said last week that Malik posted a pledge of allegiance to Islamic State on Facebook just before the shooting rampage. FBI Director James Comey, Homeland Security Secretary Jeh Johnson and John Mulligan, deputy director of the National Counterterrorism Center, planned to brief members of both houses of the U.S. Congress on Thursday about the investigation of Farook and Malik in closed, classified sessions. The Federal Bureau of Investigation is trying to determine the couple’s motivation for opening fire with assault-style rifles at a holiday party for Farook’s San Bernardino County government co-workers on Dec. 2. Twenty-one people were also wounded in the attack. 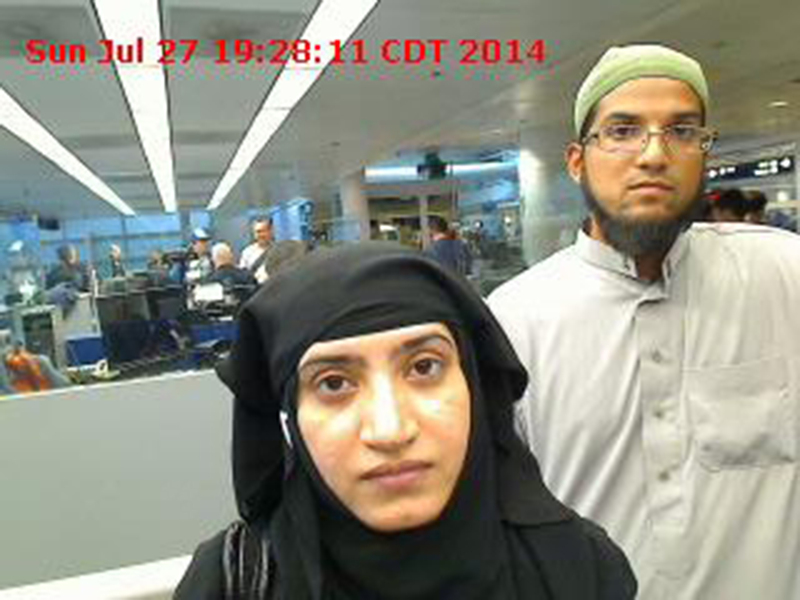 Authorities say Farook and Malik embraced radical Islam before they met online in 2013 and married last year. A law enforcement source said investigators are focusing on how Malik obtained the K-1 fiancée visa that the United States issued so she could come to the country with Farook. The K-1 program is now under scrutiny by an interagency committee that includes the State Department and the Department of Homeland Security. In a Senate Judiciary Committee hearing on Wednesday, Senator Charles Grassley of Iowa said Malik had listed a false address in Pakistan that screeners did not catch. State Department spokesman John Kirby said on CNN on Thursday that applicants for fiancée visas go through a screening process that includes fingerprinting, a series of background checks and a face-to-face interview while the other future spouse in the United States is checked by the Department of Homeland Security. Farook and Malik had been in contact with people in Orange County, California, who had been investigated by the FBI for possible ties to terrorism, but nothing arose during that investigation to draw attention to either shooter, a U.S. government source said. The source added that there is currently no evidence that the shooters had plotted with anyone who had come under FBI scrutiny. Investigators have been looking into the relationship between Farook, who was killed with his wife in a shootout with police a few hours after their assault, and Enrique Marquez, a boyhood friend. Another federal law enforcement source said Marquez and Farook had plotted some sort of attack around 2012 but abandoned it. Marquez, who legally purchased the rifles that Farook and Malik used, has not been charged with any crime. who cares what contacts they had overseas!! !we have enough terrorists already in America,we cannot import more !! !